Transport Boats are light hide over wooden frame boats capable of carrying a small number of soldiers. The Nagwonez is composed of vessels of very basic design. The wooden frame is covered by animal hides with an animal skull attached to the prow. Such ships were not suitable for longer journey, but were ideal for small scale raiding and piracy in rivers and shallow waters. Ancient Germans were not famous as ship builders, especially compared to the peaks they achieved in Viking times. 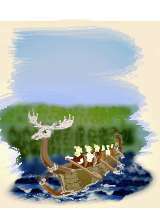 Although a number of rock carvings, especially in Scandinavia, show that boats were important, constuction was rather simple. Boats were rather small and all were propelled by oars (sails were not used before 500 AD), making them unsuitable for longer sea voyages. Still they were very useful in both rivers and for coastline voyages.